Received another lovely painting of my dear Claire Dog from Ima Jean Harrison in Texas. I simply love her work, thank you ever so much Ima Jean, Thank you! As I prepare for my upcoming Lady Long Rider Book Tour (see www.endeofthetrail.com/book-tour/ ) I realize I’m approaching it as I would a long ride. Find a route, walk myself through it again and again…and again. Prepare gear (truck & trailer) gather tack and necessary apparel. Condition the horses, new horseshoes, vaccinations and traveling papers… I am glad for the time traveling with Rosie and her truck and trailer earlier this year. It gave me valuable experience for this trip. When I conclude this book tour at Fort Edwards, New York, seven/eight months from now I’ll saddle and pack up the horses, who will, by then be rearing to move and strike out on a short 2 month ride. We’ll travel south through Pennsylvania, West Virginia, maybe Kentucky before heading back to the Montana cabin. I’m aware that riding public as I do makes me a moving target for critics. I am not complaining. Many times criticism, if you are brave enough to look, will bring humble moments of self-discovery. There is nothing heroic about what I do. I’m quite sure there are many more women and men who’d be better long riders than the rider I’ve become having ridden 30,000 miles. I by no means think I know everything about long riding. My horses and I have traveled many long, hard-earned miles together. I had no teachers. I am self taught and believe me there were so many mistakes made and as many roads and trails I wish I’d never ridden down. I have humbly apologized (more than once) to my horses for getting them into dangerous, complicated situations, into a mess. It goes on and for the most part I am willing to accept criticism and suggestions. I am not above looking at my own actions and looking at how they could be improved upon. I recently heard about a review (Amazon)… “She is aloof, the rides are really all about her, she does not put her horses first – She did not write about her horse’s enough.” I thought, “They’re right,” I had been aloof on those early rides. It was all I could do to stay alive the first few years of travel. But my horses do come first. 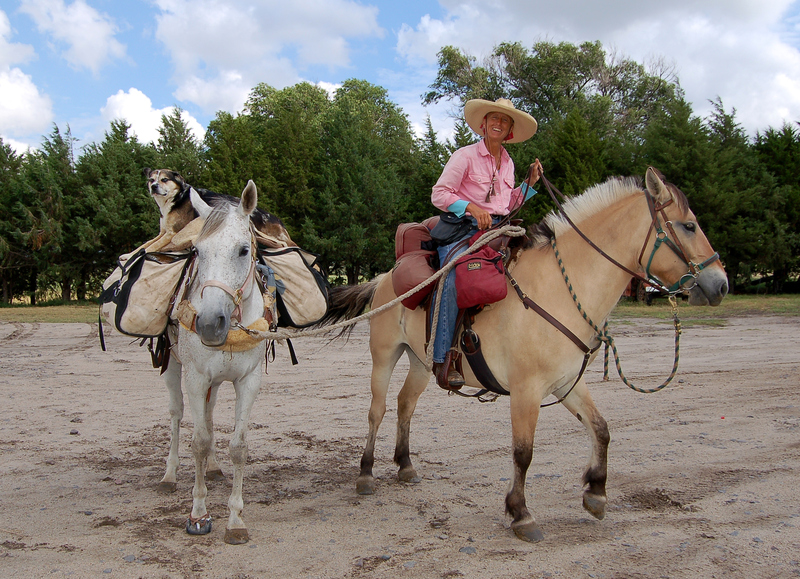 The review however did make me think, “Maybe I take for-granted this deeply personal and unique relationship I have with my horses.” The only other person I’ve met who actually lived with her horses (mules) was Jodie Foss, who wrote Mules Across the Great Wide Open. I met her when crossing Oregon in 2009, stayed at her farm a few days. I have also seen equine “liberty” trainers who brought tears to my eyes with the display of beauty and grace between human and horse and leaving me with the desire to know more about the equine/human relationship. I know it sounds crazy but with the Fjord’s its almost like having dogs around, how we relate is easy, gentle, even mischievous at times. Are my horses worse off than horses seldom ridden? Or horses handled momentarily morning and evening but live quiet, safe days in one pasture their entire lives? Bernice it would be far safer to stay home!!! Only a handful of horses in today’s world can run free and wild. The remaining which live with we humans are at our mercy are they not? I honestly believe my horses are interested, intelligent, more capable, healthier, and happier than many horses I come across. My horses have brave hearts. They are incredibly curious because they are unafraid of most things they encounter. They, like most horses that are fit, like to move, like traveling about in search of fresh grazing. I think if you met me and my horses you would find a warm, loving, happy unit consisting of two gregarious horses and one not so young woman. Our dance together is smooth and quiet. I hear them through out the night whether here at my cabin or on the road traveling where they lie next to me. They speak to me with their eyes, ears and soft rumbling neighs. We like one another, we do our work well together. Little Liska Pearl and Montana Spirit are both alpha mares, they are, but have found a peaceable arrangement which works for the most part for them. Truck and trailer? Who would have thought. Competent mechanics have gone through both the 1969 Ford PU and …… Iowa built horse trailer. New tires, bearings, brakes, engine, front-end, etc., etc. New floor, mats, brakes, electric on trailer. I shall maneuver the back roads slowly, ever so slowly. That being said, from 20 miles a day to 200 miles a day? I guess its all relative isn’t it? We’ll take breaks and stop often, go for a run, rest, stretch. I’ve allowed plenty of time between talks. I will not be pushing day after day. I have USRIDER insurance. Please, all of you, know that I sincerely try. And I will continue as I travel on this book tour to keep my horses and myself fit and happy and cared for us as best I can. It may not be the way you would do it but usually there’s a reason for my actions concerning the horses. Humbly having to step down off my high horse day after day asking for food, water, shelter, or directions has ( I like to think) produced a more empathetic person not so quick to judge. My horses have been my greatest teachers with daily lessons in devotion, trust, willingness, endurance. But so have the 100s of families and individuals who for no reason offered kindness with food, a shower, encouragement, shelter, corrals, safety. Trail Angels. From the bottom of my heart I thank you, all those who have been following my rides, for what ever reason, all these years. You fit in my saddlebags, vicariously. Your spirits do not weigh much, but are soundly felt. 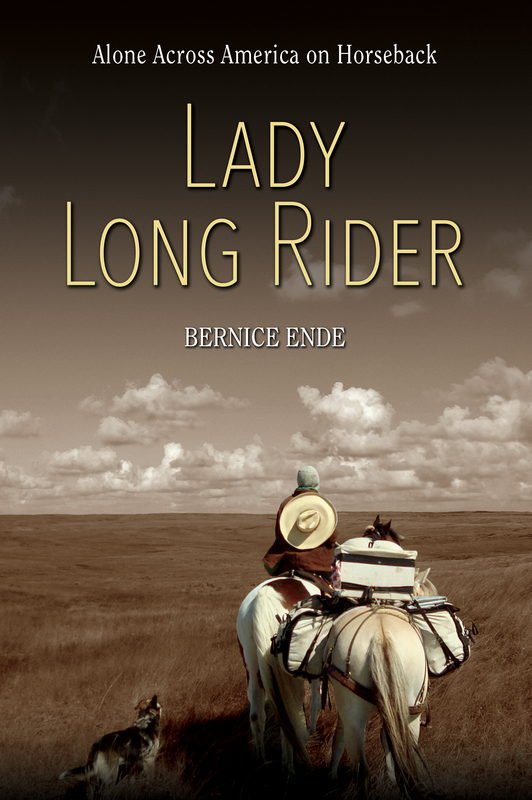 This Lady Long Rider Book Tour will take me through my earlier routes with the opportunity to see faces I met years ago (and not so long ago)… an opportunity to once again say, “Thank you.” Already it is beginning to feel like the “Lady Long Rider’s Reunion Book Tour.” All those years and miles of riding would not have happened without a great deal of help. I hope to share what I discovered long riding, what I learned, and how it re-shaped my thinking. I also realize traveling with truck and trailer offers risks I would never encounter traveling at 4 miles an hour with only the horses. Friends from each state are reaching out with support for which I am beyond grateful. But at some point I will single-minded-ly turn and leave everything behind except the road ahead. Sarah Wilson will be helping with emails, Facebook, and the endeofthetrail.com website. If you receive a response from her instead of me, you’ll know who it is. If anyone knows where I am it will be her. Zach Basinger, marketing and publicity manager at Farcountry Press, is handling much of the booking for talks once I leave. As with any long ride once I leave I must be focused with attentiveness, caution and skill thinking how best to move forward. Until I am there – I am not. If for no other reason I do hope with all my heart that my rides will impart encouragement to those longing to reach beyond their fears for more. Polson Public Librarians were as surprised as I at the turn-out on the 26th of Sept. presentation.